For many baseball players, Champro baseball pants are a godsend. There’s no downplaying the importance of good pants in baseball, after all. If you play baseball, you have to deal with running and sliding around the bases, and you don’t want to do that while wearing low quality pants. You’ll also often find yourself running all around while fielding balls and that may mean having to jump and slide too. You know what parents want? They want quality for a budget price. Guess What? Champro baseball pants fit the bill! This comes with piping down the sides. They’re available in either white or light gray, with the piping (3/16 inches) in black, navy blue, scarlet red, or royal purple. It offers a nicely loose fit with a straight leg, with an open bottom. The fabric comes with a 4-way stretch, and the inseam design allows you adjust the length of the inseam which you can secure with Velcro. This comes with a 2.5-inch knit waistband with silica gel. The tunnel belt loops come with a pro styling, and there are 2 inset back pockets. The pants handle abrasion nicely, and it also features reinforced double knees. Cleaning it isn’t a problem even with dirt stains, since you can just leave it soaking in detergent overnight. If it’s not too dirty, then you can just machine wash the polyester fabric. This looks very cool, and that’s very important for many youth players these days. It comes in many kid-appropriate sizes, even for those with long skinny legs or for players with a more muscular build. The pants are also very easy to adjust for comfort and fit. It’s tough and can handle lots of sliding about. The silica gel helps keep your shirt tucked in. It’s great that the pants are easy to adjust, since the size difference between extra-small and small is somewhat significant. 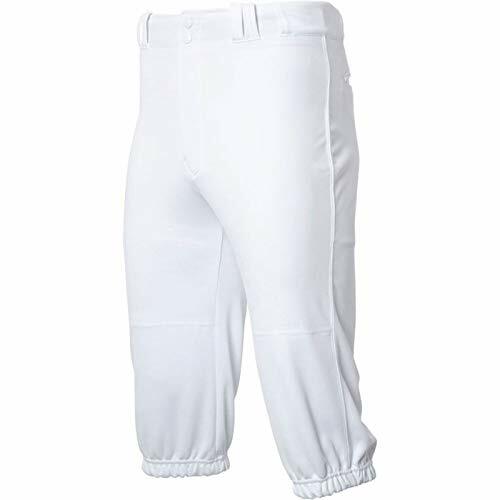 The Triple Crown Champro youth baseball pants with piping are also available for adult players, and they’re also available in different colors. Since it’s the same thing as the youth version, it offers all the features you’ve read about already. It also rocks the same “pros”. Many people like the look and feel of these pants, and in fact they’re the choice of many players over the issued pants. They fit nicely and very comfortably. The inseams range from 33 (S and M) to 35 inches (XL). The S waist measures 28.5 inches, while M is 32″, L is 36″ and XL is 40″. Almost all the leg opening measurements are 16 inches, except it’s 16.5 for the XL. Again, these pants are sturdy and comfortable, and they’re also easy to clean. There are no “cons” to deal with, unless you hate both white and dark gray options. FEEL YOUR BEST, PLAY YOUR BEST: Champros Open Bottom Relaxed Fit Baseball pants are tough against running, sliding, and batting to keep up with all your moves on the diamond. And while you are feeling great because of the soft 12.5 ounce. polyester fabric. 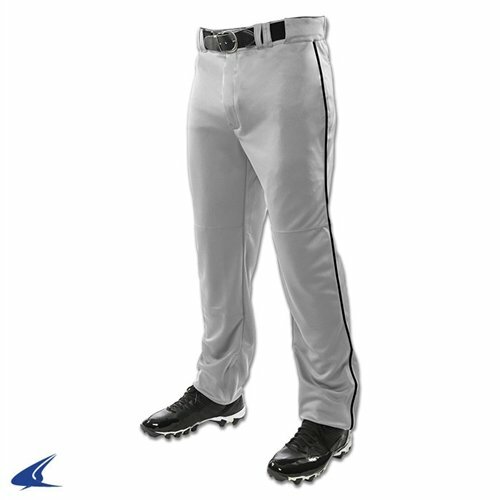 You will play as good as you feel in these fabulous baseball pants. PROFESSIONAL TAILORING AND BASEBALL STYLE: If you want to play like the professionals, you first have to look like the professionals. These pants feature professional style tailoring and details making them the ideal pants for all kinds of positions out on the field. So even if it is your first year playing, you will look like a seasoned pro. COMFORTABLE AND REINFORCED FIT: In the heat of the moment, you cannot afford to have any issues with your uniform. The Open Bottom Relaxed Fit Pants from Champro feature a 2 inch elastic waistband with tunnel belt loops and double snap closure so you get a comfortable and secure fit. The double knee reinforces the fabric to prevent wear and tear as well. CHOSEN BY PROFESSIONALS: CHAMPRO Sports maintains specifications and performance standards equal to, and in many cases exceed those of more heavily advertised brands. Teams and athletes choose our products because they perform better. CHAMPRO Sports equipment and apparel is distributed exclusively through sporting goods specialty stores. 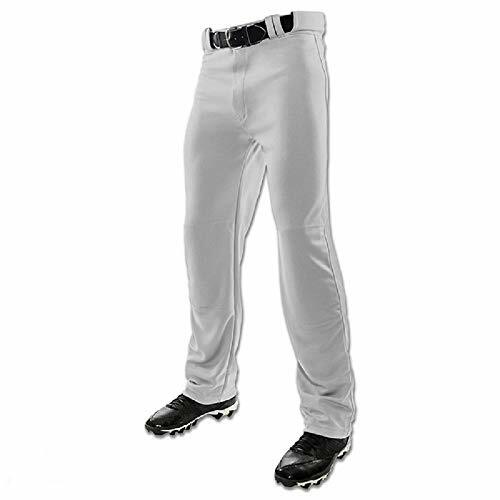 PRODUCT SPECIFICATIONS: Package contains (1) Champro Youth Open Bottom Relaxed Fit Baseball Pant. 12.5 ounce. polyester fabric. Professional tailoring and features. 2 inch elastic waistband with tunnel belt loops and double snap closure. Double knee. Brass YKK zipper. Two inset back pockets. This a great pair of baseball pants, and they’re especially well-suited for newbies. The relaxed fit doesn’t make you feel self-conscious, unlike the tighter-fitting pants. The 12.5-ounce polyester fabric also feels nice against your skin as you run a round. It does have a very professional look, and it gets the pro details right. The 2-inch waistband is elastic, and you run your belt through the double tunnel loops. It also has a brass zipper to go along with 2 inset back pockets. It comes in a solid color light color that looks nice enough even if you’re not playing baseball. It looks very much like the ones the MLB pros use when they play. It lets you run around without impeding your movements. They have double reinforcement around the knees. It should fit you very well, as you can adjust it to your dimensions. The fabric is soft yet tough, and it’s not a problem to clean. The polyester also don’t show sweat stains, which can be embarrassing. It’s a fairly affordable pair of baseball pants, so there aren’t any high-tech moisture-wicking features. These are all in solid colors, from black, graphite (dark gray), light gray, and white. The styling is definitely for baseball, as it has a 2-snap closure and 2 belt loops on the left and right sides of the 2.5-inch waist band. You also have a zipper fly and a silica gel feature that helps with keeping your shirt tucked in, along with 2 back pockets. The double-knit fabric is nice and soft, but it’s in a professional weight that’s abrasion-resistant too. You can adjust the bottom hem up to 5 inches and secure it with Velcro tabs. The knee area is also reinforced. The availability of both light and dark gray offers more choices for your look. It’s easy to adjust the fit and it’s not really too tight for most people. They’re super comfy to use and run in. The knee area may not be overly protected with the extra thin material added for reinforcement. It can be very annoying to keep rolling your pants up to just below your knees. If that’s the look you like, then these Champro youth baseball pants are perfect because that’s the length it comes in. These are definitely just for baseball, even though it doesn’t have that piping. It’s available in 4 colors, including light and dark gray along with black and white. The straight leg pattern lets you run freely. Again, you have the classic 2.5 inch-knit waistband with silica gel, 2 tunnel belt loops and 2 snap closures, along with a durable zipper. The polyester offers a pro weight and 2-way stretch that’s not see-through. Just don’t think about rocking this look in any other situation aside from playing baseball! Baseball pants are about both form and function. You have to feel comfortable wearing them, and that also means you need to like your look. No one likes to look silly, and youth players are especially sensitive about the fashion aspects of sports apparel. 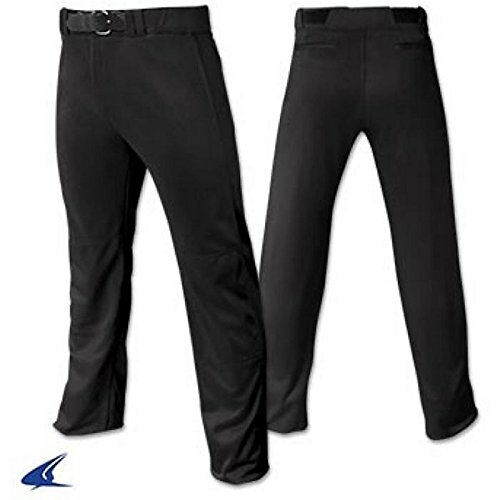 Fortunately, Champro sports baseball pants are both comfortable and stylish, and they’re available in various adult and youth sizes. Protection. The primary purpose of baseball pants are to protect you, whether you’re diving around making a catch or sliding into home plate as the hitter makes contact with the ball. You can get hurt from the coarse infield dirt if you’re wearing the wrong kind of pants. That’s why most of the time, the fabric has been reinforced at the rear and knees because these are the most common impact points. The reinforced fabric absorbs some of the force of the impact, so you don’t get too hurt, while it also keeps the pants from getting easily torn. Softness. On the other hand, players also want to feel comfy. That’s why the fabric of the pants, while strong, should also feel comfy against the skin. Whether the fit is tight or relaxed, you should feel good while you’re standing around waiting for the play to come your way, or while you’re running. It should also stretch nicely. Proper fit. You’ll notice that many players tend to obsess on what looks cool when you read their comments and reviews. The nice thing about Champro sports baseball pants is that they’re available in all sizes and styles, whether you want a more relaxed fit or you want it tight. You can also get pants that you can roll up. Length. Fashion trends also come and go in baseball, and that covers the length of the baseball pants. It’s great that Champro offers many different length styles, from very long which can virtually cover the cleats, to very short that ends right below the knees. Many of the pants also offer adjustment options, so you can get the length just right. What About Piping, Pockets, etc. The piping. There are 3 basic looks in baseball. You have the solid look, which can any type of baseball shirt uniform. There are Champro baseball pants with piping, which is the standard look and it feels more “serious”. Keeping the shirt tucked in. You have to tuck in your shirt in baseball, so you’ll need a belt. That means your pants need sturdy belt loops too. Pockets. Some players like having pockets in their pants, so they have a place to put their hitting or base-running gloves. Easy to clean. These pants often get very dirty, so it helps a lot if they’re easily cleaned with the laundry machine. This is especially important because these pants are usually in light colors, and dirt on them can be very obvious. Brand recognition. You can opt for really famous sports brands, though that means you may end up paying really outrageous prices. However, a no-name brand isn’t really good, since the build quality may not be all that high. With Champro pants, at least you get the best of both worlds, as the brand is fairly well-known for the last quarter of a century, and the prices are pretty reasonable.